This is a graduate textbook on the principles of linear inverse problems, methods of their approximate solution, and practical application in imaging. The level of mathematical treatment is kept as low as possible to make the book suitable for a wide range of readers from different backgrounds in science and engineering. Mathematical prerequisites are first courses in analysis, geometry, linear algebra, probability theory, and Fourier analysis. The authors concentrate on presenting easily implementable and fast solution algorithms. With examples and exercised throughout, the book will provide the reader with the appropriate background for a clear understanding of the essence of inverse problems (ill-posedness and its cure) and, consequently, for an intelligent assessment of the rapidly growing literature on these problems. 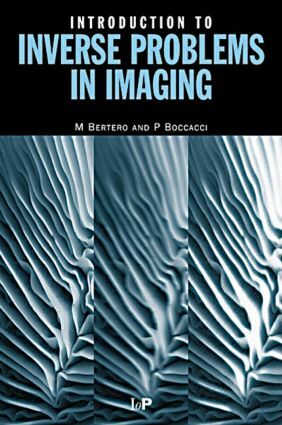 "This is an essential book for all those interested imaging systems and the image derived from them … I would like to take this opportunity to congratulate the authors on an excellent publication which should find a wide audience in an area of application mathematics that is becoming increasingly important." "Although this valuable book is both an introduction into a modern field and instruction for the solution of difficult identification problems in imaging and metrology. It can be recommended to all students, scientists, and engineers who are interested in the state of the art of solving inverse problems or who are practically dealing with modern approaches of image processing such as active vision." What is an ll-posed problem? Does there exist a general-purpose method?